Google has finally been rolling out its new massively redesigned Gmail for desktop and mobile to 1.4 billion of users worldwide, which might be the most significant single upgrade in Gmail's history. 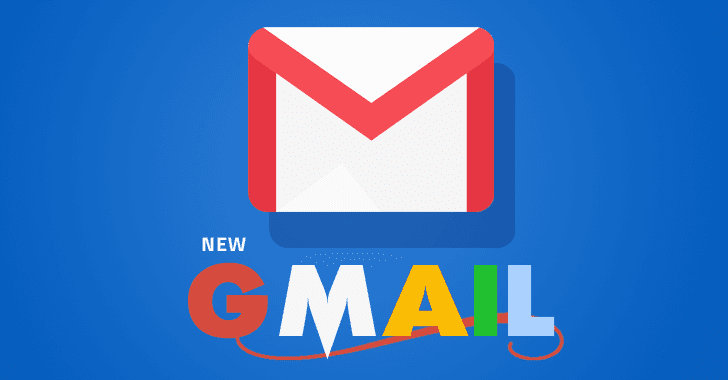 This huge revamped version of the email service now offers plenty of new features such as confidential mode, offline support, email snoozing and more, to make Gmail more smarter, secure, and easier to use. In this article, I have listed details of the most significant changes that you need to know and how to use them. Give it a quick read. Are you afraid of sending sensitive documents in an email due to fear of hacking or being forwarded? Well, now you can simply click the lock icon at the bottom of an email to enable the new Confidential Mode, which lets you add a bunch of extra layers of security (as mentioned below) to the emails of your choice. 1) Self-Destructing Emails: This feature lets you send emails that disappear from the recipient's inbox after a period (between 1 day and five years) you specify or which you can revoke at any time even after you have sent them. Select the second option from the right side of the send button bar given in the bottom of the screen. It's a tiny lock with a clock on it. Now choose how long you want the email to live before it self-destructs. You can choose between 1 day and 5 years. You are done. Now the email will automatically delete itself after the predetermined self-destruction time period ends. The clock starts right when you send the email, not when the recipient opens it. If the recipient opens the email until the predefined time window you set, he/she will able to read the email, or otherwise it will vanish. Besides this, you can also revoke access to your emails if you want. For that, you need to open Gmail, select "Sent," open the confidential email you just sent and then select "Remove Access." 2) Un-Forwardable Emails: Confidential emails open in a special window that does not allow the recipient to forward, copy or print the email, though recipients can still grab a screenshot, or snap a photo from their phone. 3) Two-factor Authentication (2FA) for Emails: If you're paranoid, you can even enable 2FA for a single email, requiring recipients to enter a secret passcode send to them via SMS before opening it. All the above Confidential Mode features work even with emails sent to non-Gmail users, requiring them to click on a link before opening confidential emails. 1) Email Snoozing: Google now gives you the ability to snooze emails and become more organized when answering emails. So, if you notice any emails that require a lengthy response cannot be responded immediately, you can snooze the messages for later. Once snoozed, that email will hide from the inbox and show up again at the time you chose. This feature is already offered by Google's Inbox app, the mobile version of Microsoft Outlook, but now Google has brought it to Gmail to help you boost productivity. 2) Nudges: While snooze emails are set by you manually, nudges are those reminded to you by Google. To help your task easier of going through massive amounts of emails to find important emails, Gmail uses artificial intelligence (AI) to remind you of those emails that sit in your inbox unattended and its AI thinks they are important. 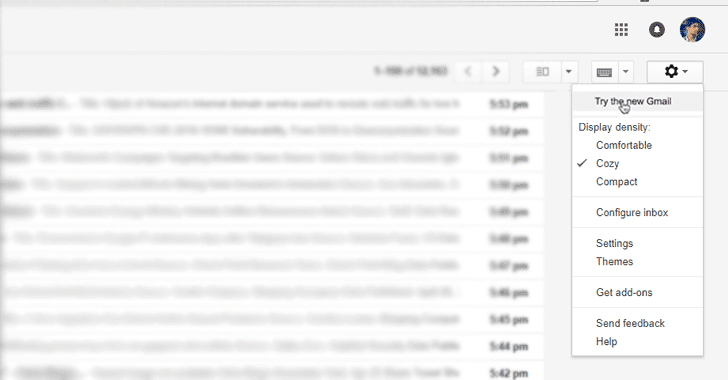 Gmail will show up these nudged emails at the top of your inbox with an indicator of how long it’s been sitting there. 3) Smart Replies: Not just Gmail intelligently reminds of important emails to you, it also makes suggestions for tasks that you need to do, like replying to a certain email using "Smart Replies." With Smart Replies, Google offers you intelligent touch-button responses to the web version of Gmail, a feature that was first introduced in 2015 for the mobile version of Gmail. You can turn this off if you want. Besides security and AI, Google is adding a bunch of new management features. 1) Native offline mode: Until now, using Gmail without Internet requires a third-party Chrome plugin to be installed, but now with the built-in offline mode, you can write responses to your emails while on a flight, and then sync your inbox and send them once you land—thanks to Progressive Web Apps (PWA). 2) High-priority notifications: This feature will send you notifications for an incoming email if Gmail thinks it is important to you—based on factors like how typically you respond to email from the sender in question. These features were made available to Inbox users last year. 3) Gmail Tasks: Existed as a to-do list application within Gmail for years, Gmail Tasks is available as part of Gmail and as a standalone app for iOS and Android. The feature has also been given a major upgrade to manage work on the go—from your messages to your calendar. The biggest new change in Gmail is the sidebar to the right, which gives you quick access to a new version of Google Tasks, pop-up versions of Google Calendar, Keep note-taking app, and 3rd-party services that use Gmail's add-on technology, like Asana, Dialpad, and DocuSign. 4) Inbox enhancers: You can now directly take actions on an email without opening it as you can directly open attachments in an email without having to click into the email itself. You can also RSVP to calendar invitations and even snooze messages without opening them. 5) One-tap unsubscribe prompt: Although Gmail already has a feature that lets users unsubscribe from ads and other bulk email lists you don't respond to, now Gmail proactively ask you tounsubscribe specific lists when it notices you don’t tend to click or you always insta-delete. 6) Anti-Phishing Enhancements: Though Google is already offering anti-phishing functionalities to warn its Gmail users of phishing attempts, the company has now increased the size of the banners (a gigantic, billboard-like message) it puts on top of dodgy emails to warn users they should not click the links within. Also, if you get an email that is supposedly from one of your contacts, but originates from an unfamiliar email address, Gmail will tell you that something may be wrong. 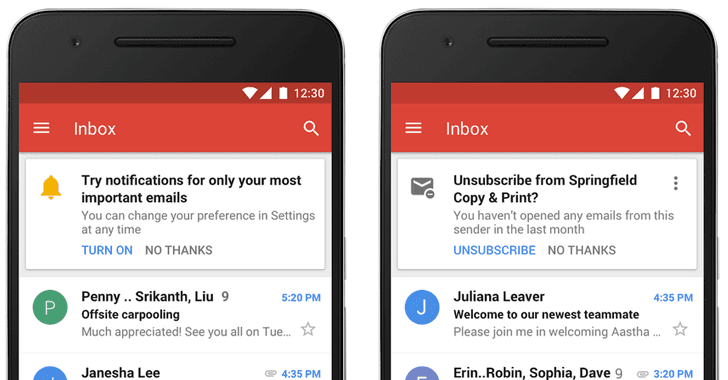 Getting the all new Gmail depends on the type of Google account you have. If you are a regular Gmail user, you can enable the new Gmail by clicking on the Settings icon in the top-right corner, then select "Try the new Gmail" option, if available. If you are using the G Suite account for work or school, you can enable the new Gmail through the Early Adopter Program. The administrator can use the Google Admin console and opt-in to the new Gmail. However, it should be noted that all the features as mentioned above will not be immediately available at this moment. 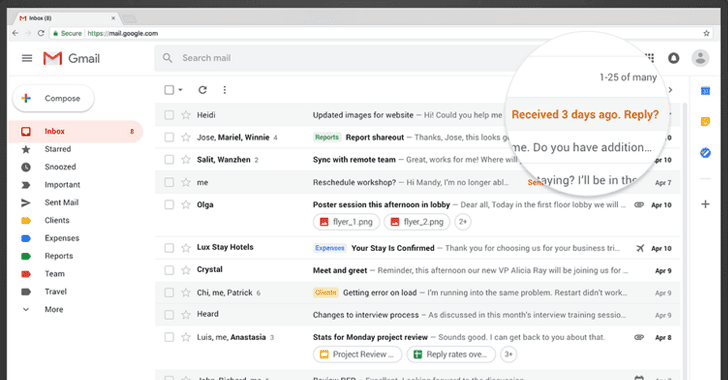 Features available at the launch include smart replies, snooze emails and a new tool panel on the right side of Gmail's interface for quickly accessing Tasks and Calendar.